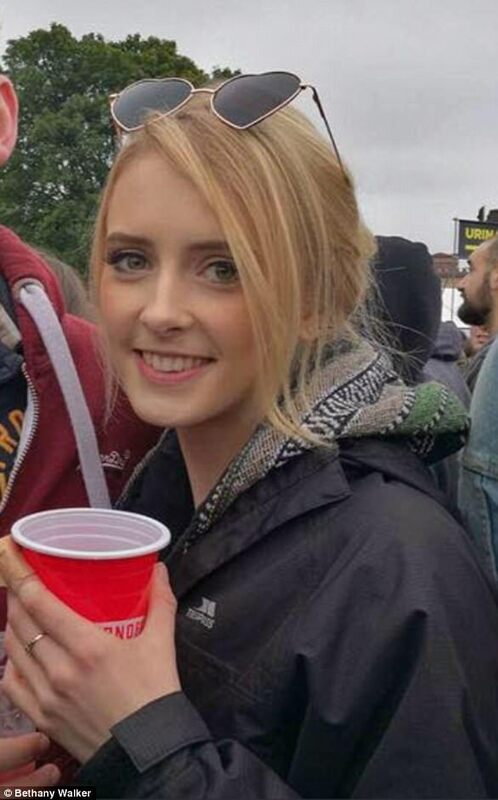 A mother has revealed her heartache after her 18-year-old daughter died from one of the deadly flu bugs currently sweeping the UK. Bethany Walker, of Applecross in northern Scotland, passed away from pneumonia, which was triggered by the virus, last week. Her death comes as flu fatalities have soared by 77 per cent in just a week in England, Government figures reveal as fears of the worst outbreak in 50 years loom large. Miss Walker was one of four to die in Scotland from flu last week alone, with 27 new fatalities recorded in England. A similar in-depth breakdown of figures doesn't exist for Wales, Northern Ireland or Scotland. Figures also show that for every 100,000 patients in Scotland, 107.3 have displayed ‘influenza-like’ symptoms in their GP consultations. This is more than double the amount in Northern Ireland (52.6) and almost triple that of Wales (38.9). In contrast, England’s rate is 37.3. Public Health England data also shows the killer virus has left 1,938 in hospital since October - a quarter because of 'Aussie flu' and half from 'Japanese flu'. Cases of flu have reached their worst levels since 2010/11. This is adding extra pressure onto an already stretched NHS, which is considered to be in the midst of its worst winter on record. 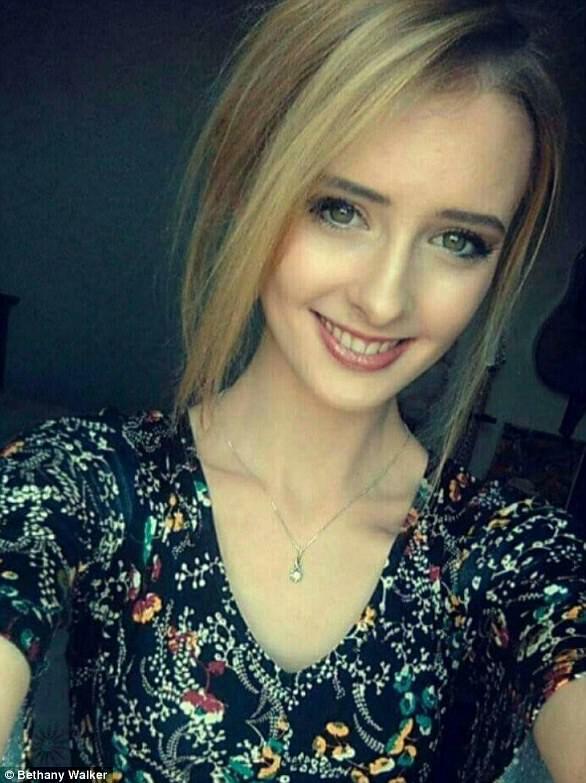 An 18-year-old girl has become the tragic victim of the flu, her heartbroken mother has revealed. Bethany Walker, from Applecross, died after taking ill at home - initially from flu symptoms which later developed into pneumonia. Miss Walker was airlifted to Raigmore Hospital in Inverness but died later last Friday. Tributes have poured in on social media. Her mother Heather Teale wrote on Facebook: 'My beautiful Daughter Bethany Walker was taken from me yesterday (Jan 5). 'She had been suffering from a flu virus, which became pneumonia. 'She was airlifted to Raigmore with me by her side yesterday morning (Jan 5), where she rapidly deteriorated. She added: 'I am broken, the bottom has fallen out of my world. I have my mum with me, and my wonderful son Danny Walker who are both feeling the same loss as I am. 'Life will never be the same again. Bethany, I love you to the moon and back, I always have and I always will, you were the best daughter I could have ever wished for and I will always be the proudest mum in the world. Among those paying his respects was TV adventurer Monty Halls, who lived on the Applecross peninsula in 2008 for his Great Escapes series. He wrote: 'Heather, I am so, so sorry to hear this news - it is beyond comprehension. Words seem so completely inadequate. 'Every member of the film crew for Great Escapes remembers her so fondly, a total delight. The Applecross Inn Facebook also paid its own special tribute: 'Farewell to dear Bethany another fantastic member of our team who we sadly lost last Friday after a short illness, you were the 'belle of the ball' at Hogmanay......and indeed everywhere. 'Such a tragic loss of someone so perfect in every way, so polite, such beauty, humour, fun, music and studies. Miss Walker wanted to study midwifery and was due to head for Aberdeen University later this year. The new PHE figures come as others have also lost their battle with the killer virus. 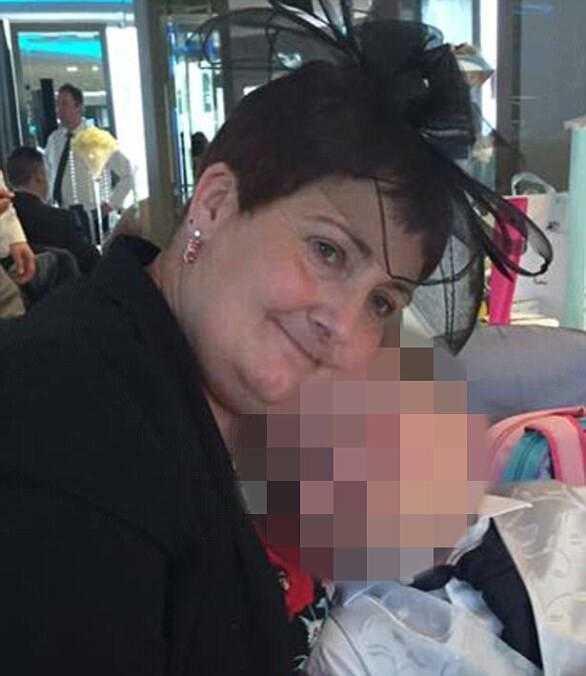 They include Melanie Coombs, a 56-year-old grandmother, who died from flu - after beating terminal cancer twice. World War II veteran Owen Hardy, 95, from Chichester, has also died from flu during the past week, his grieving daughter revealed. During his time in the RAF, he was awarded the top medal for valour – the Legion d’Honneur. Health bosses have blamed the rapidly escalating cases of flu for their controversial decision to cancel 55,000 operations last week - a move also made by French officials as the European country battles an epidemic. Experts fear the dreaded Aussie flu is more severe than the Swine flu pandemic of 2009 which killed nearly 300,000 people across the world. One includes the so-called 'Aussie flu', a strain of influenza A which triggered triple the number of expected cases in Australia during the country's winter. 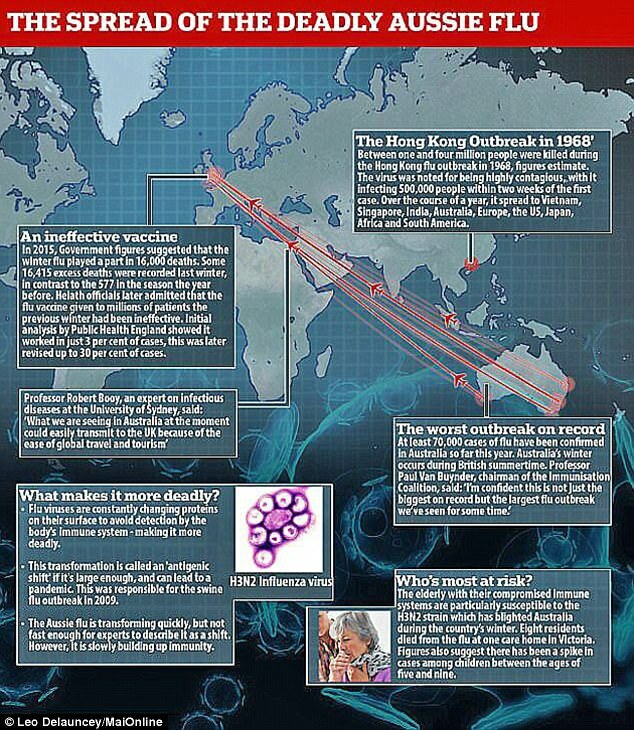 Experts fear the virulent H3N2 strain, which has now reached the UK, could prove as deadly to humanity as the Hong Kong flu in 1968, which killed one million people. The other is a strain of influenza B, called Yamagata and dubbed 'Japanese flu', which has been blamed for the majority of cases so far this winter. Its rapid spread has raised concerns because it is not covered in a vaccine given to the elderly. Usually, just one subtype, either influenza A or B, is responsible for the majority of cases. It spreads easily in the cold weather. Of the 1,938 confirmed hospital cases of flu, 432 have been caused by H3N2. Some 199 were caused by H1N1, which triggered the 1918 Spanish Flu pandemic that killed 50 million. A further 448 strains of influenza A were unidentified. 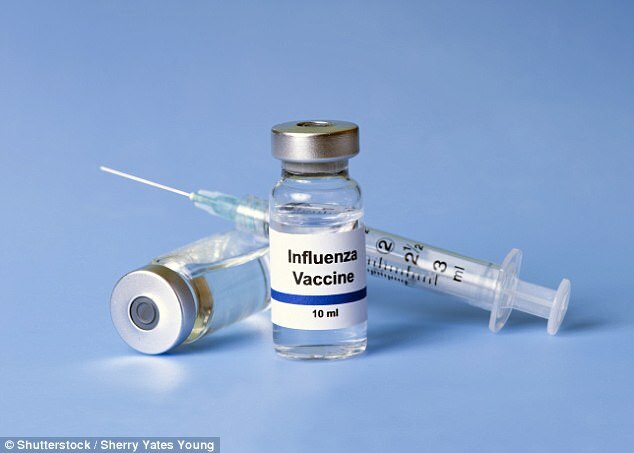 The remaining 859 cases were caused by strains of influenza B, including 'Japanese flu', which usually produces less side effects, according to PHE data. HOW IS THE REST OF THE UK FARING? Scotland has seen cases of flu more than double in the past week and is now the worst affected nation in the UK, figures from Health Protection Scotland show. It is unclear how many flu deaths have occurred in Scotland already this winter – but it has one of the highest number of excess deaths in Europe. The term ‘excess deaths’ is used when more deaths have occurred than expected and the figure is calculated using data analysis from previous years. Scotland is considered to be the only country in the UK to be suffering from ‘excess deaths’. No data exists to pinpoint the exact number of deaths in either Wales or Northern Ireland. Figures also show that for every 100,000 patients in Scotland, 107.3 have displayed ‘influenza-like’ symptoms in their GP consultations. This is more than double the amount in Northern Ireland (52.6) and almost triple that of Wales (38.9). In contrast, England’s rate is 37.3. The widow reported hallucinations - a symptom echoed by many sufferers struck down the flu this winter - as well as a fever. Her condition rapidly deteriorated as she was rushed to Eastbourne District General Hospital, which is where she eventually passed away. Doctors have yet to confirm if Ms Coombs succumbed to flu, but Mr Butler warned her symptoms matched that of the 'Aussie flu' virus sweeping the UK. She was first diagnosed with cancer four years ago. Ms Coombs, who was 'almost clear' of bowel cancer, went on to beat terminal duodenal cancer twice. A World War II Spitfire veteran has died after contracting one of the killer flu strains that is currently circulating the UK, his grieving daughter has revealed. Owen Hardy, 95, from Chichester, lost his battle to the bug on January 4. His family have said his death is a ‘huge loss for the nation’. During his time serving for the RAF in the war, the wing commander’s heroics saw him be awarded the top medal for valour – the Legion d’Honneur. His heartbroken daughter, Debbie Elliott, told the Chichester Observer: ‘It’s a huge loss. We’re all devastated. He has left a huge gap in all of our lives. The veteran pilot, described as a 'very modest and quiet man', also was awarded Britain's Distinguished Flying Cross and Bar. 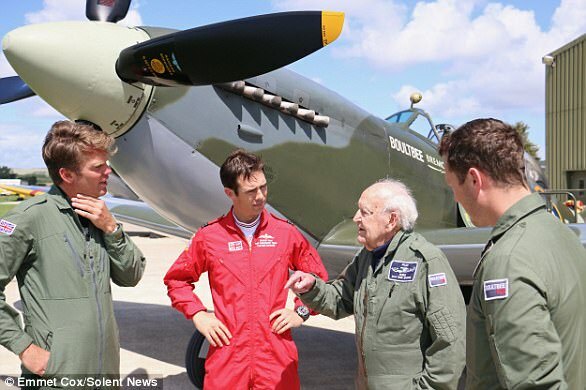 He was able to perform a barrel roll while he was in control of a Spitfire during an event at Goodwood last year. Mr Hardy, who was born in New Zealand, left behind five great-grandchildren, four grandchildren, his daughter Ms Elliot and son Andrew. At this point last year, deemed week two by PHE, just 497 people had been hospitalised by flu. However, this winter's outbreak shows no signs of slowing down, as flu cases are expected to rocket even further in the coming weeks. An analysis of data from week one shows the number of new cases each week is 9 times higher than that of 2015 - when 296 were recorded. His comments came as a leading virologist predicted another cold snap will fuel the spread of H3N2 and 'kick cases into another orbit'. Professor John Oxford, of Queen Mary University in London, exclusively warned that the killer virus spreads much easier when temperatures plummet. Forecasters believe the cold weather will continue - forcing adults to flock indoors and be surrounded by others where they can catch flu easier. Latest figures show 2,551 people have been infected with norovirus since July. The figure has raised at a steady level week-on-week since October. 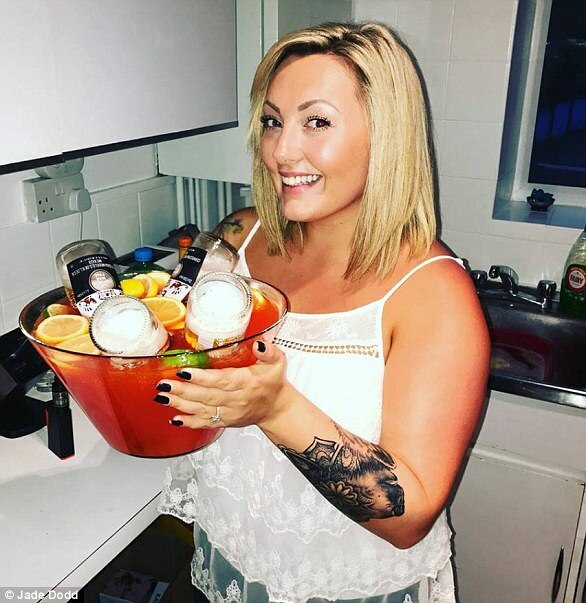 A 27-year-old woman feared she was ‘going to die’ after she claims she caught the killer ‘Aussie flu’ virus that is currently circulating the UK. Jade Dodd, from Brighton, described her two-week battle with the dreaded bug, which left her bedbound, as the ‘worst of my life’. In an interview with The Argus, she said: ‘I’ve had flu once before, but this was a whole other level. You can hardly move and everything just hits you at once. I thought I was going to die. ‘I felt as if I was sitting in a sauna with a terrible hangover. My throat hurt so badly that it hurt to swallow. 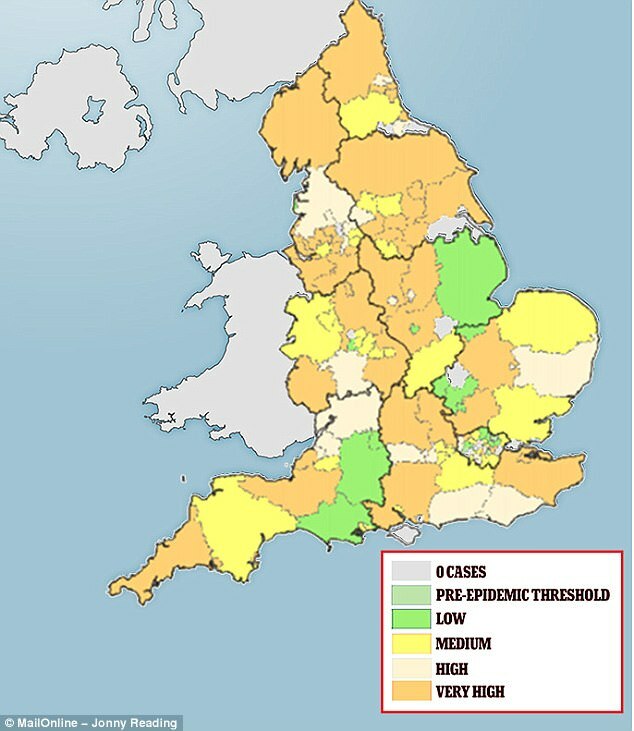 Tests have yet to confirm her fears, but the H3N2 strain of influenza A, more commonly known as Aussie flu, has rapidly spread across the south of England in recent weeks. And in the US, the flu is already gripping 36 states and has killed at least 70 people in the US, according to data released by the CDC. Professor Oxford has also revealed he is keeping his 'fingers crossed' as he fears the current epidemic in France could replicate itself in Britain. 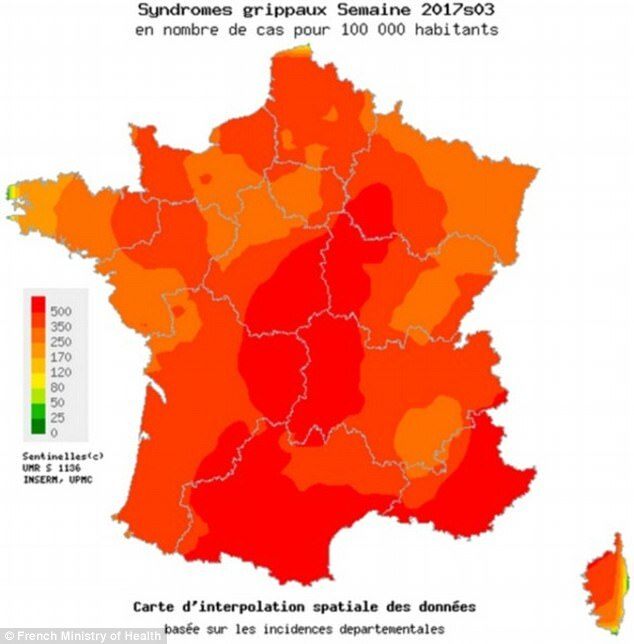 The rocketing cases prompted Marisol Touraine, the country's health minister, to delay non-urgent operations to free up hospital beds. This controversial move was mirrored by Jeremy Hunt last week, with the NHS having being plunged into chaos amid a spike in flu cases. The strain has been responsible for a surge in cases of flu across England and Wales this winter - putting extra pressure on the NHS.